I am a postdoctoral research associate at Los Alamos National Laboratory. Prior to this, I was a research staff member at IBM Research. I hold a Ph.D. in computer science from the University of Minnesota and a B.A. also in computer science from Macalester College. My work focuses on large-scale data analysis and human-centered computing. I work to empower communities to make better decisions in pursuit of a sustainable and just global future. I do this by exploring the tools, algorithms, and systems that facilitate human communication, collaboration, and shared creation of knowledge, with a current focus on the use of these things to answer quantitative quesions about the real world. In my spare time, I enjoy reading, bicycling, hiking (especially in the mountains and deserts of the American West), tinkering with things, photography, and hanging out with my wife and son. My research portfolio, with annotated publications. 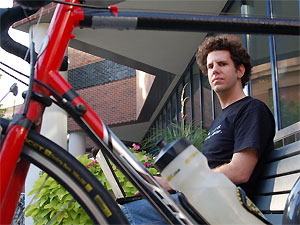 Cyclopath, a research project which I co-founded, is a geowiki and route-finding service for cyclists in the Minneapolis/St. Paul metro area. I created an open-source bibliography manager called Yabman. It’s currently usable but in a pre-alpha state. Lambda, a system for sound processing, which earned me departmental honors at Macalester College. Adventures – trip reports and other adventure resources. Miscellaneous photos of myself and friends. Some lists and logs pertinent to my life. Why I oppose the death penalty. How to load custom topo maps into your Garmin GPS using Linux. Copyright © 1999-2013 Reid Priedhorsky. Last modified: 2014-03-23 21:08 MDT. Disclaimer.